You'll almost certainly know the opening lines, and there's a decent chance you'll know the closing ones. 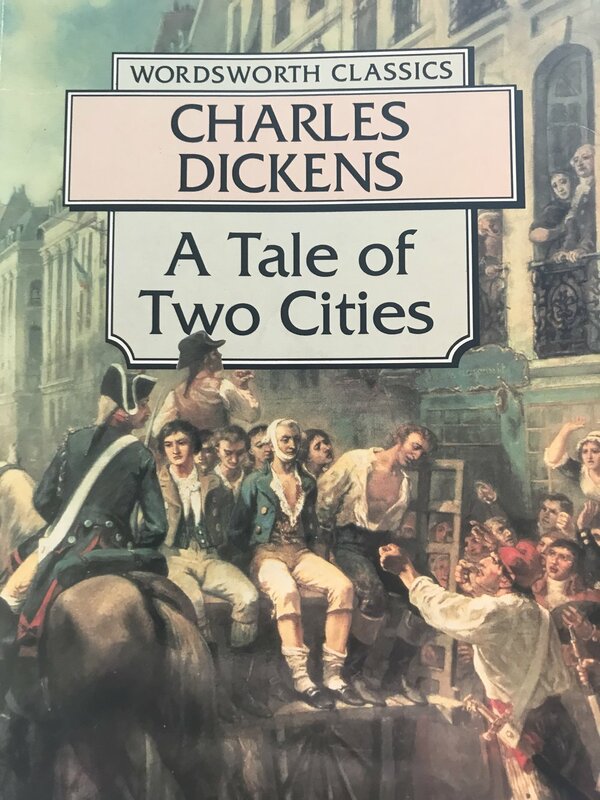 You'll know the two cities of the title are Paris and London, and that the French Revolution plays a central part in this story. But only in reading it do you get the full sense of everything Dickens conveys. The terror of The Terror, the claustrophobia of the Bastille, the cold obsession of Madame Defarge (undoubtedly the most memorable knitting revolutionary in literary history), and his message, the golden thread throughout, that nobody is ever beyond redemption. On the page, this is really a book about the French revolution. Large swathes are played out in London, but Dickens' focus throughout feels like it is on Paris and the events taking place there. But it's still a tale of two cities. Dickens supported the cause of the revolution but not its methods. That much is clear from his writing. His fear, it seems, was that those methods would cross the channel and sweep through the other city of the title. This book was his clear warning against that. This is the sort of book that difficult to finish. We read the closing chapter on the Northern Line and looked around afterwards perturbed by the normality around us. Why could nobody see what we had just been through! That last monologue, with talk of redemption and freedom, of struggle and beauty, remains as relevant now as it was in the 1859 when it was written. 'It is a far, far better thing that I do, than I have ever done' says the book's final line. Dickens may have been reflecting on what he'd just finished writing. But it's also an invocation.